Your free inspection provides information and peace of mind. Colorado’s climate is severe and tough on roofs. Metro Denver is often referred to as the “mile-high” city. The area is exposed to much greater UV exposure than a typical city. Colorado is known for breaking down architectural materials, including your commercial roofing. This harsh exposure takes its toll on every type of roof system. Our commercial roof maintenance program will clear gutters, scuppers, drains, downspouts, touch up seams, re-calk penetrations and flashing, will photo-document work done and will demonstrate that you are maintaining your roof at warrantable standards. 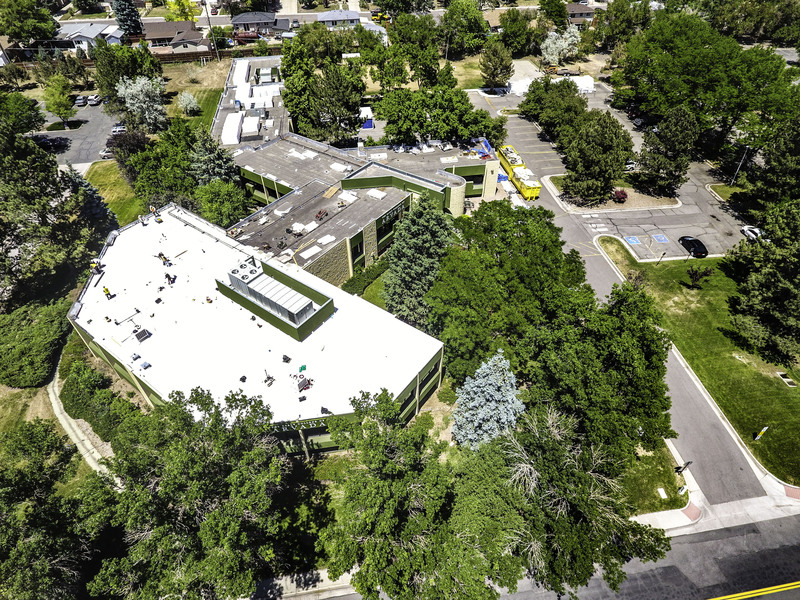 Western Roofing has over 20 years of experience maintaining commercial flat and low sloped roofs, keeping Colorado businesses going. Learn more about our ongoing maintenance contracts. 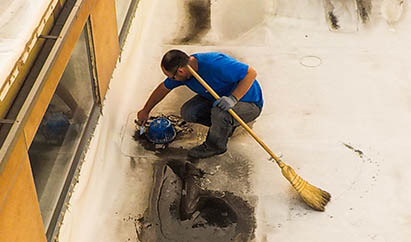 When a rooftop leak requires more than the regular touchup, Western Roofing is here to provide commercial roof repair to maintain your existing roof structure. Repairing a small leak now can save on substantial interior damages later. Small issues can turn into major leaks down the road. Even worse, an ignored leak can develop into mold, rust, substrate deterioration, joist damage and more. Repairs can help keep the roof up to the manufacturer’s warrantable standard. If these are ignored, some big manufacturers may have the opportunity to void the long term warranty. At the right time we can seal part or all of your existing roof to extend its useful life. Western Roofing has seen and repaired it all. We work with PVC, EPDM, TPO, Tar and Gravel, Metal and Shingle to replace whatever system you are currently under. Learn about your commercial roof replacement options. Read more about available commercial roof repair services. When it comes time to replace your existing roof you need a commercial roofing company with the experience and history to do the job right and to be there to maintain your new roof for years to come. Western Roofing offers multiple commercial roofing solutions that will meet your needs. Our premium Duro-Last commercial roofing system offers a complete edge-to-edge & Deck-to-sky system. This includes all the materials involved in your re-roofing project: insulation, skylights, substrates, metal and the toughest single-ply roofing material, all under one of the industry’s leading warranties. We are experts in insurance claim work and will partner with you and your insurance company’s adjuster in the case of a claim to insure documentation of the proper scope of work to bring back your roof to excellent condition. Our desire is to be the difference between your roofing need and your roofing solution, and we will work our hardest until the job is complete. Our partnership with Duro-Last started over 20 years ago. We have worked hand in hand with the Duro-Last brand to provide top of the line installation of their industry leading materials, manufacturing and specifications. Watch our video to learn more about our ongoing partnership. 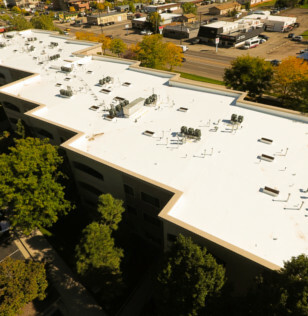 Colorado has been hit by more and heavier hail storms over the last decade than in years prior, resulting in extensive damage to commercial and industrial rooftops across the front range. To protect your valuable operations, we recommend installing a Duro-Last Class IV Impact Resistant Roof. We have installed these systems to protect everything from physical documents, workspaces, and computer servers to grain, sand and cement, all which are at high risk of damage if leaks aren’t stopped. We’re there when you need us: rain, shine, or hail. When rains are forecast for the day after a bad hail storm, our teams are often on roofs well after midnight to patch, cover, and protect our client’s properties. Learn what Duro-Last can do for your facility. The Roofing Industry often has a bad rap. You’ll hear horror stories about General Contractors/roofers setting up office in a co-working space or coming in from out of state with promises of quality, only to turn over jobs to fly-by-night subcontractors with little or no rooftop experience. Western cuts through the noise with over 20 years of quality commercial roof repair and replacement experience under our belt. We are members of the Colorado Roofing Association, Better Business Bureau (BBB), and Community Associations Institute, and we have worked extensively with multi family unit apartment managers to assure the roof that protects their residents and their resident’s belongings meets or exceeds standard. When your discount General Contractor is long gone, we’ll be there providing regular maintenance, repairs and recommendations to help your property manager accurately budget for the care of your existing roof. When the next storm comes along, we’ll be on the other end of the phone, ready to respond to your emergency 24 hours per day. We built our business on the principle that relationships matter, and that a handshake means we’ll stick by our word. With Western and Duro-Last, of course, our handshake is backed up by the industry’s best warranty, covering materials and labor, and with consequential damage options, you can rest assured that should you face a catastrophic failure, you’ll be covered. Western Roofing is the only installer of Duro-Last roofs in Colorado to meet the Platinum Installer standard. Because our work is inspected directly by Duro-Last technical inspectors, you are assured that our work meets the Duro-Last expectation for quality.